Implemented as an ActiveX control, FlowChartX provides your applications with the ability to create and present various kinds of flow diagrams. 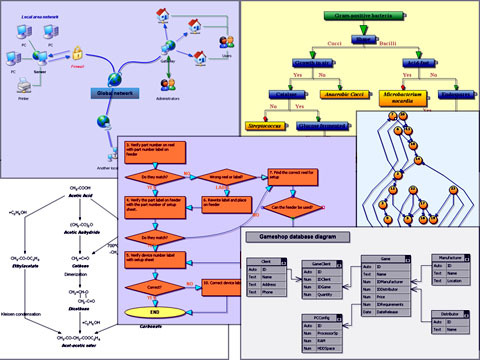 A few to mention are workflow, flowchart, process, database entity relationship diagrams, organizational, hierarchy and network charts, graphs and trees. The basic item types, boxes, tables and arrows, can be grouped or attached one to another to form complex structures. The control provides more than 80 stock box shapes, and it is possible to define new ones programmatically. Even further customization can be done via custom painting of boxes. Diagram nodes - boxes and tables - can display both images and formatted text. Customizable fonts and colors and multiple arrow styles let you get the right appearance of your charts. Other features include an alignment grid; shadow effects; scrolling and zooming; locking; z-order; and pen styles. Diagrams can be printed, exported as image files, stored in OLE compound documents or in separate documents. The control's programming model comprises more than 600 methods, properties, and events. Full source code is available for purchase too, giving you unlimited ability to customize the control. MindFusion provides free technical support for both registered clients and evaluators. Besides, with their initial purchase customers are entitled to 6 month upgrade subscription. FlowChartX is royalty free for client and server side use.